The Oral-B 6500 is one of the most popular Oral-B electric toothbrushes. Its simplicity, effectiveness and versatility has seen it become a favourite for many people. As the smart tech revolution has taken over everything from homes to cars and appliances, no one really expected toothbrushes to join the bandwagon. Oral-B has proven those assumptions wrong. Their Smart Series electric toothbrushes are easier and much more fun to use than your old manual toothbrush. Most importantly, the additional features have proven helpful in improving dental hygiene. It has not just been a matter of adding fancy features with no real purpose. 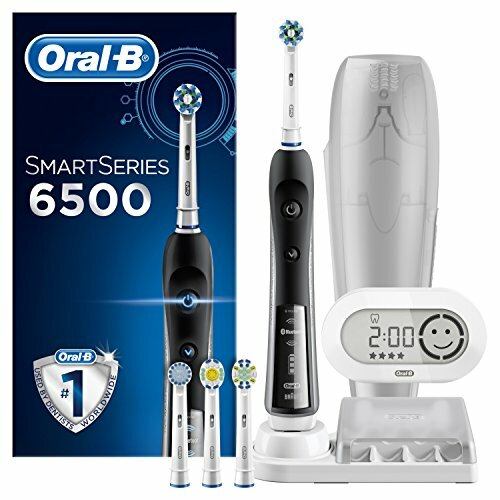 If you want a step up from your usual electric toothbrush to something a bit more sophisticated and modern, try the Oral-B Smart Series 6500 CrossAction electric toothbrush. The round brush head is designed to contour around each individual tooth, providing a deeper and more thorough clean. The bristles are able to reach between teeth to remove any debris and are much better than manual toothbrush bristles at breaking up plaque. Furthermore, the bristles are designed with a rounded end that is gentler on your gums and especially beneficial for those with sensitivity issues. The angled and rounded bristles are complemented by a 3D cleaning action. The brush head rotates, oscillates and pulsates, ensuring that nothing can stand in its way. Most people report seeing their teeth getting whiter within a few days. Like most other Oral-B toothbrushes, the 6500 CrossAction comes with a pressure sensor embedded inside. Its function is to detect how much force you are using to brush your teeth. If it’s too much, the sensor automatically lowers brushing speed to protect your teeth and gum from damage. It also alerts you, helping you develop better brushing habits. The Oral B 6500 comes with wireless Bluetooth connectivity. This allows the toothbrush to pair with the Oral-B app on your smartphone. As you brush, the app can track your movements and analyse your brushing habits. It uses that information to coach you on how to brush better and improve your dental hygiene. Daily clean – the basic everyday cleaning that breaks up plaque and removes every bit of debris from your teeth. Gum care – a specialized mode made specifically for your gums. In this mode, the toothbrush gently massages and stimulates your gums to clean them and boost circulation. Especially beneficial for those with gingivitis. Sensitive – for those with extra sensitive teeth and gums. The toothbrush switches to a gentle yet still effective cleaning mode. Whitening – the best mode for getting rid of coffee, tobacco or any other unseemly stains on your teeth. Deep clean – a specialized mode that involves more aggressive cleaning with the brush head rotating and oscillating at higher speeds than usual. Tongue cleaner – for removing plaque and bacterial build up on your tongue. Very easy. You use it just like any other electric toothbrush. Switching between different modes and changing brush heads is no trouble at all. The only process that takes a little more time is pairing the toothbrush to your phone. The best thing about the Oral-B 6500 is how natural it feels against the teeth. The round brush head makes it feel like a perfect fit for your teeth. 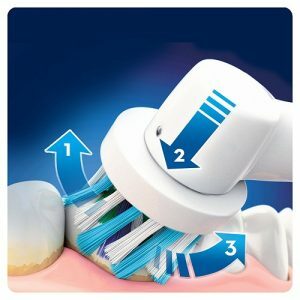 You don’t have to worry about buying brush head replacements any time soon because the Oral-B 6500 comes with four refills. The package also includes a charging station that connects to your power socket using a UK 2-pin plug. The charging dock has a convenient brush head storage compartment. If you spend a lot of time on the road, you will appreciate the travel case included with the toothbrush. Easy to use with built-in timer to help you brush for the recommended 2 minutes. Replacement brush heads and travel case included. Real-time brushing coach through wireless Bluetooth connection. After many complaints regarding the battery life of the 6500 CrossAction, Oral-B upgraded the battery to a lithium ion one. The new toothbrush has a much longer battery life, lasting as long as 2 weeks between charges.